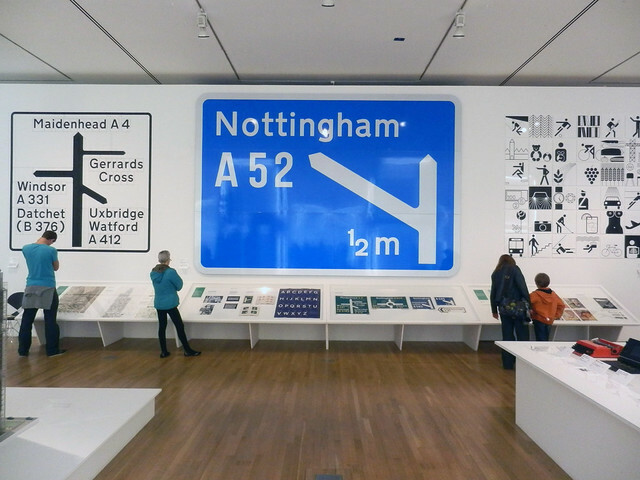 If you have traveled in Britain, you have been surrounded by the work of designer and typographer Margaret Calvert(1936-). 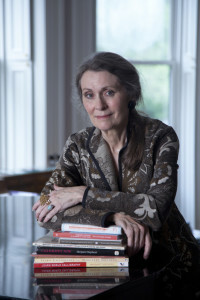 While studying illustration at Chelsea School of Art, she had to the opportunity to be the assistant to Jock Kinneir in designing signs for the new motorway, and this turned into designing for all of Britain’s roadways and they became Kinneir, Calvert and Associates, and took on the railways and many other projects. 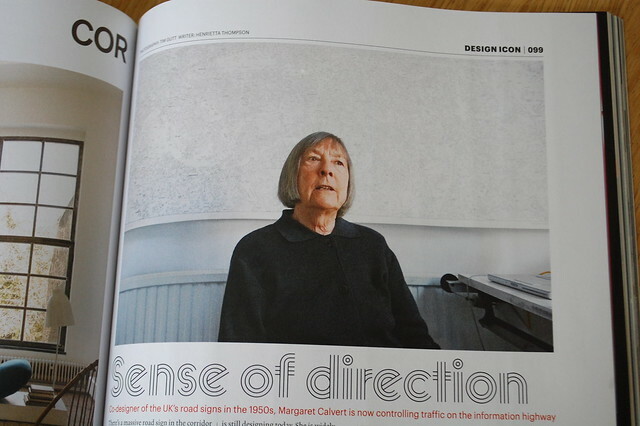 Take a few minutes to watch the video President’s Lecture: Margaret Calvert, where she describes her feeling for the letters, the white space as important as the text itself, and her sense of play in drawing and drafting. Her self portrait is just perfect. 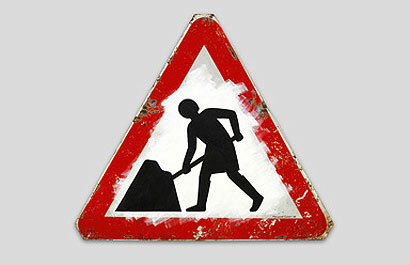 She found a Men at Work sign from her design in the street, and took it home and turned it into herself: Woman at Work. She describes how the signs are about the people who use them: how will this look to someone driving 70 mph? Can it be read at that speed? Calvert and Kinneir met with controversy at first because they used capitals with lowercase letters instead of the traditional all capitals. Typography is near to my heart because of the house numbers I create along with my husband at Nutmeg Designs. Flowing around number forms gives me an intimate sense of each digit. I didn’t expect to find this so rewarding. We want our house numbers to be beautiful and visible. I remember when my husband saw a hapless pizza delivery guy on the sidewalk looking for a house. He pointed to our neighbor’s house, with the number we had created, and said “I can read that number,” and wished that all were that easy to make out. There is a quote that has circulated with great vigor on the internet ether, “Sometimes your only available mode of transportation is a leap of faith.” It is attributed to Margaret Shepard, and as I searched to find more about the author, nothing came up except more permutations of the quote and then finally, someone mentioned this Margaret is a calligrapher. 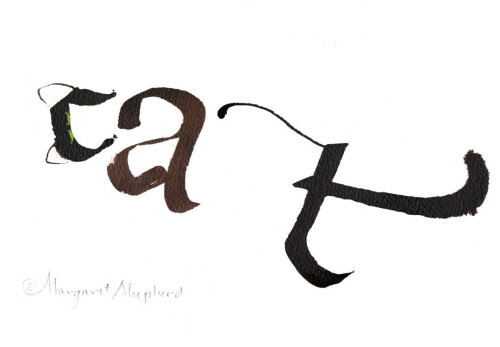 Then I found Margaret Shepherd, and I suspect the quote is an example for calligraphy in one of her books. I had been eager to move from printing to cursive in the 2nd grade. I loved making the joins, and studying the letter forms. When I was a junior high student, I bought a book about learning calligraphy(which may have even been written by Margaret Shepherd), and some of those chisel tipped pens that purport to be the key to beautiful writing. I carried the book and pen around for many moves, but calligraphy happened in mostly my imagination. For someone who lived for reading, an art that incorporated words was thrilling, but again, I was first and foremost a reader, not a calligrapher. Margaret Shepherd helped create the Boston Calligraphy Trail, which I hadn’t known about, and which sounds wonderful. There are 26 beautiful letters to discover in the Boston Public Library and surrounding neighborhoods by following the trail guide. On her blog she writes of returning from Finland with photos of Art Nouveau lettering and numbers. I love that she was photographing typography in the wild. 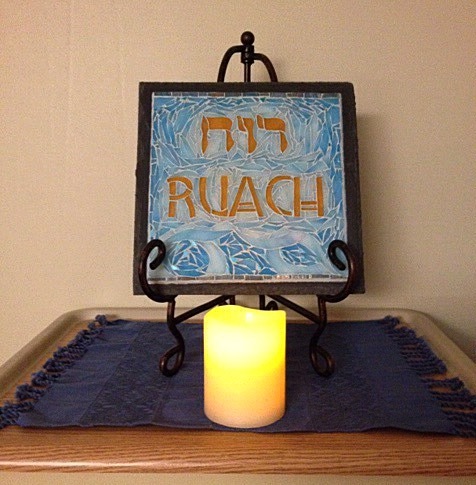 Ruach for Frank. Commissioned for inspiration while he was in the hospital. 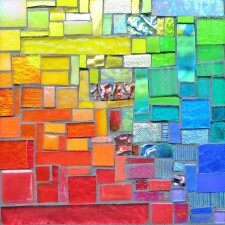 The Breath of Life, glass on slate, 12×12 inches, © 2015 Nutmeg Designs. As someone who spends a lot of time surrounding letters and numbers with glass mosaic, I do now practice a craft that incorporates reading. Many leaps of faith led me to this work. 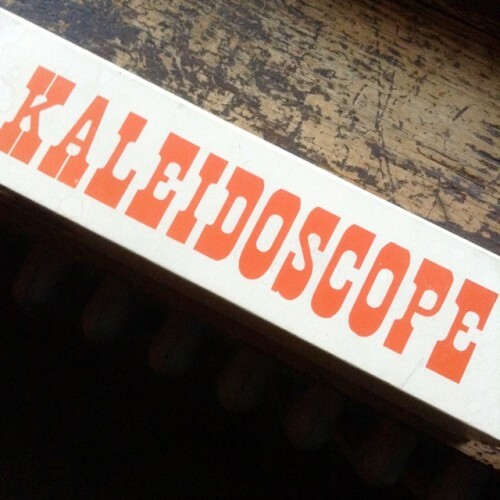 Kaleidoscope Box in Orange, circa 1970, Japan. This Kaleidoscope has moved many places with me, and I don’t remember when it came into my possession. Looking at it now, I see the type as 1970’s, in the way time makes us able to classify collections, characteristics that are invisible to us as children. Butterfly Porthole, Kaleidoscope from Japan, circa 1970. The butterfly revealed by the orange circle was the most fascinating butterfly. It had a window to the world. 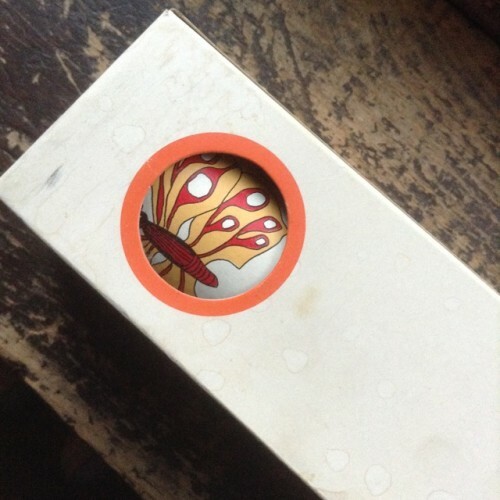 The box has two of these portholes, on opposite sides. Butterfly Kaleidoscope from Japan, circa 1970. 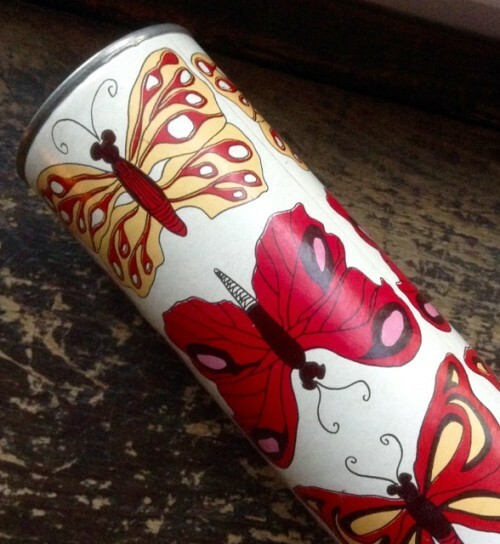 The Kaleidoscope has the heft of a mailing tube, with a visible seam where the label wraps around. The eyepiece is a hole cut from red cardboard, revealing the plastic underneath. There are no objects orbiting around inside the case to create the patterns. This is a type called a Teleidoscope, which according to David Brewster, Scottish physicist and inventor of the Kaleidoscope, means the mirrors inside transform the world around you into art. I remember pointing the Butterfly Kaleidscope at the world around me as a girl, and seeing transformation, and yet recognizing some of the forms and colors, even as they were reflected. Ysleta Spanish Mission, near El Paso, Texas. Established in 1682 via Boston Public Library on Flickr. Y is for Ysleta, TX. 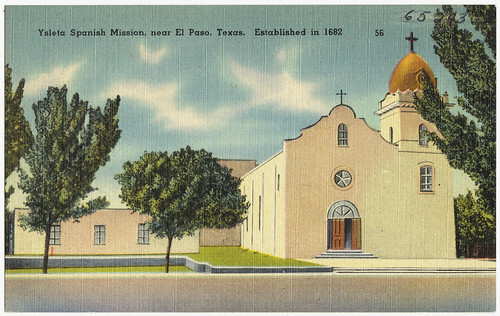 I lived in El Paso, TX during the 4th grade, when my father was on sabbatical, and we rented a house near my grandparents. I went to Loma Terrace Elementary School part of the Ysleta Independent School District. The name Ysleta came from the mission settlement, established in 1682 by Spaniards and Tigua Indians fleeing the Pueblo Revolt in NM. El Paso annexed Ysleta in 1955. I didn’t know any of this when I was in the 4th grade, but I did love the sound of the word Ysleta. Moving from Canada to the desert of Western Texas was a shock. One way I insulated myself was reading. My father kept our schedule of visiting the library on Saturdays. 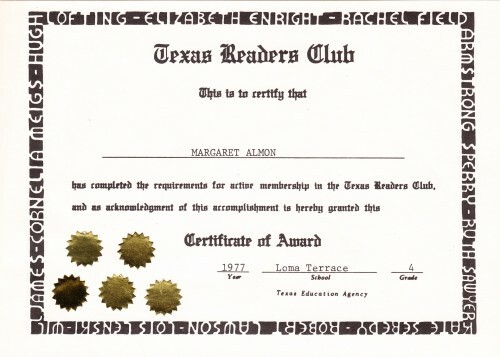 I have 5 gold stars on my Texas Readers Club Certificate of Award. Each star stood for 10 books. Now I want to look up the authors in the border of the certificate. I only recognize Lois Lenski. My previous A to Z posts. More images on my A to Z Challenge 2013 Pinterest Board.